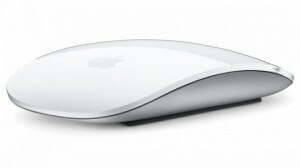 Ubuntu 10.10 Supports Magic Mouse Out-Of-The-Box? Well, it looks like Ubuntu 10.10 Maverick Meerkat is getting better and better everyday. According to Jasev from UbuntuForums, Ubuntu 10.10 Maverick Meerkat supports Apple's Magic Mouse out-of-the-box. Update: Reader Martey points out that this is not Ubuntu specific. It is due to a driver, written by Michael Poole, that has been included in Linux kernel 2.6.35. I just got my magic mouse and was expecting problems, but to my delight scrolling works out of the box. I'm running an up to date 10.10 (alpha?) with kernel 2.6.35-13. I guess all the drivers have been inserted into the new kernel. Haven't tried any 2-finger zooming etc as yet. It may be recalled that Ubuntu 10.04 Lucid Lynx introduced support for iPhone and iPod Touch out-of-the-box as well. So, it is not very surprising that Magic Mouse would be supported in Maverick. I do not have a Magic Mouse and so I cannot test it. (Hence, the question mark in the title. :p). If you have a Magic Mouse, we would love to hear from you.